For the geographical region, see San Francisco Bay Area. For the California wine region, see San Francisco Bay AVA. The bay covers somewhere between 400 and 1,600 square miles (1,000–4,000 km2), depending on which sub-bays (such as San Pablo Bay), estuaries, wetlands, and so on are included in the measurement. The main part of the bay measures three to twelve miles (5–19 km) wide east-to-west and somewhere between 48 miles (77 km)1 and 60 miles (97 km)2 north-to-south. It is the largest Pacific estuary in the Americas. The bay was navigable as far south as San Jose until the 1850s, when hydraulic mining released massive amounts of sediment from the rivers that settled in those parts of the bay that had little or no current. Later, wetlands and inlets were deliberately filled in, reducing the Bay's size since the mid-19th century by as much as one third. Recently, large areas of wetlands have been restored, further confusing the issue of the Bay's size. Despite its value as a waterway and harbor, many thousands of acres of marshy wetlands at the edges of the bay were, for many years, considered wasted space. As a result, soil excavated for building projects or dredged from channels was often dumped onto the wetlands and other parts of the bay as landfill. From the mid-19th century through the late 20th century, more than a third of the original bay was filled and often built on. The deep, damp soil in these areas is subject to soil liquefaction during earthquakes, and most of the major damage close to the Bay in the Loma Prieta earthquake of 1989 occurred to structures on these areas. 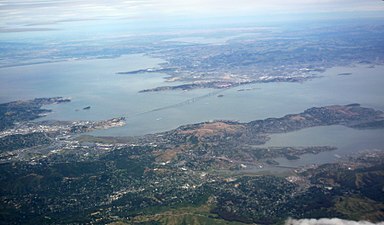 There are five large islands in San Francisco Bay. Alameda, the largest island, was created when a shipping lane was cut to form the Port of Oakland in 1901. It is now a suburban community. Angel Island was known as "Ellis Island West" because it served as the entry point for immigrants from East Asia. It is now a state park accessible by ferry. 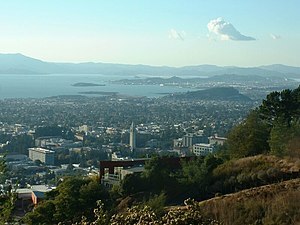 Mountainous Yerba Buena Island is pierced by a tunnel linking the east and west spans of the San Francisco–Oakland Bay Bridge. Attached to the north is the artificial and flat Treasure Island, site of the 1939 Golden Gate International Exposition. From the Second World War until the 1990s, both islands served as military bases and are now being redeveloped. 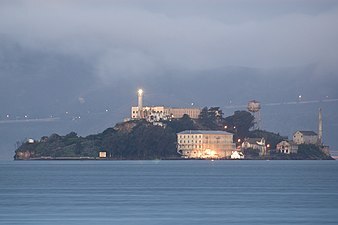 Isolated in the center of the Bay is Alcatraz, the site of the famous federal penitentiary. The federal prison on Alcatraz Island no longer functions, but the complex is a popular tourist site. Despite its name, Mare Island in the northern part of the bay is a peninsula rather than an island. 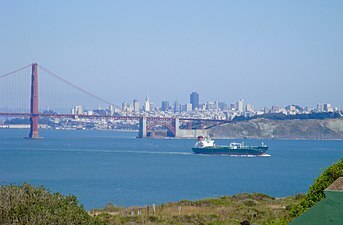 Panorama of San Francisco Bay, and the city skyline seen from Marin County in the Golden Gate National Recreation Area. San Francisco Bay is thought to represent a down-warping of the Earth's crust between the San Andreas Fault to the west and the Hayward Fault to the east, though the precise nature of this remains under study. About 560,000 years ago, a tectonic shift caused the large inland Lake Corcoran to spill out the central valley and through the Carquinez Strait, carving out sediment and forming canyons in what is now the northern part of the San Francisco Bay and Golden Gate strait. Until the last ice age, the basin which is now filled by the San Francisco Bay was a large linear valley with small hills, similar to most of the valleys of the Coast Ranges. As the great ice sheets began to melt, around 11,000 years ago, the sea level started to rise. By 5000 BC the sea level rose 300 feet (90 m), filling the valley with water from the Pacific. The valley become a bay, and the small hills became islands. From 15,000 – 10,000 years ago, the Ohlone tribe inhabited the area that is now the San Francisco Bay. The natives were displaced 5,000 years ago as the bay filled with water due to the rising sea level at the end of the ice age. The first European to see San Francisco Bay is likely N. de Morena who was left at New Albion at Drakes Bay in Marin County, California by Sir Francis Drake in 1579 and then walked to Mexico. The first recorded European discovery of San Francisco Bay was on November 4, 1769 when Spanish explorer Gaspar de Portolà, unable to find the port of Monterey, California, continued north close to what is now Pacifica and reached the summit of the 1,200-foot-high (370 m) Sweeney Ridge, now marked as the place where he first sighted San Francisco Bay. Portolá and his party did not realize what they had discovered, thinking they had arrived at a large arm of what is now called Drakes Bay. 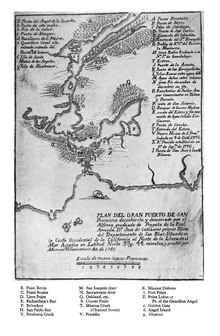 At the time, Drakes Bay went by the name Bahia de San Francisco and thus both bodies of water became associated with the name. Eventually, the larger, more important body of water fully appropriated the name San Francisco Bay. The first European to enter the bay is believed to have been the Spanish explorer Juan de Ayala, who passed through the Golden Gate on August 5, 1775 in his ship the San Carlos, and moored in a bay of Angel Island now known as Ayala Cove. Ayala continued to explore the Bay area and the expedition's cartographer, José de Cañizares, gathered the information necessary to produce the first map of the San Francisco Bay area. A number of place names survive (anglicized) from that first map, including Point Reyes, Angel Island, Farallon Islands and Alcatraz Island. The United States seized the region from Mexico during the Mexican–American War (1846–1848). On February 2, 1848, the Mexican province of Alta California was annexed to the U.S. with the signing of the Treaty of Guadalupe Hidalgo. A year and a half later, California requested to join the United States on December 3, 1849 and was accepted as the 31st State of the Union on September 9, 1850. The bay became the center of American settlement and commerce in the Far West through most of the remainder of the 19th century. During the California Gold Rush (1848–1855), San Francisco Bay suddenly became one of the world's great seaports, dominating shipping in the American West until the last years of the 19th century. The bay's regional importance increased further when the First Transcontinental Railroad was connected to its western terminus at Alameda on September 6, 1869. The terminus was switched to the Oakland Long Wharf two months later on November 8, 1869. During the 20th century, the bay was subject to the Reber Plan, which would have filled in parts of the bay in order to increase industrial activity along the waterfront. In 1959, the United States Army Corps of Engineers released a report stating that if current infill trends continued, the bay would be as big as a shipping channel by 2020. This news created the Save the Bay movement in 1960, which mobilized to stop the infill of wetlands and the bay in general, which had shrunk to two-thirds of its size in the century before 1961. San Francisco Bay continues to support some of the densest industrial production and urban settlement in the United States. 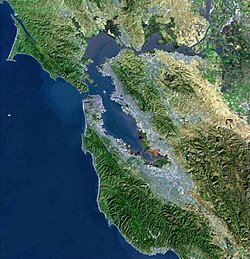 The San Francisco Bay Area is the American West's second-largest urban area with approximately seven million residents. 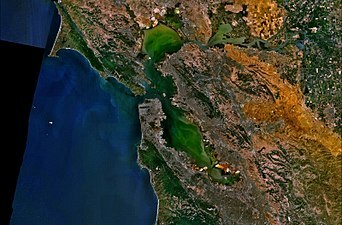 Despite its urban and industrial character, San Francisco Bay and the Sacramento-San Joaquin Delta remain perhaps California's most important ecological habitats. California's Dungeness crab, California halibut, and Pacific salmon fisheries rely on the bay as a nursery. The few remaining salt marshes now represent most of California's remaining salt marsh, supporting a number of endangered species and providing key ecosystem services such as filtering pollutants and sediments from the rivers. San Francisco Bay is recognized for protection by the California Bays and Estuaries Policy, with oversight provided by the San Francisco Estuary Partnership. Most famously, the bay is a key link in the Pacific Flyway. Millions of waterfowl annually use the bay shallows as a refuge. Two endangered species of birds are found here: the California least tern and the Ridgway's Rail. Exposed bay muds provide important feeding areas for shorebirds, but underlying layers of bay mud pose geological hazards for structures near many parts of the bay perimeter. 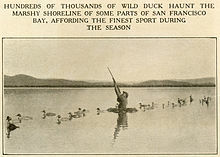 San Francisco Bay provided the nation's first wildlife refuge, Oakland's artificial Lake Merritt, constructed in the 1860s, and America's first urban National Wildlife Refuge, the Don Edwards San Francisco Bay National Wildlife Refuge (SFBNWR) in 1972. The Bay is also plagued by non-native species. Salt produced from San Francisco Bay is produced in salt evaporation ponds and is shipped throughout the Western United States to bakeries, canneries, fisheries, cheese makers and other food industries and used to de-ice winter highways, clean kidney dialysis machines, for animal nutrition, and in many industries. Many companies have produced salt in the Bay, with the Leslie Salt Company the largest private land owner in the Bay Area in the 1940s. Low-salinity salt ponds mirror the ecosystem of the bay, with fish and fish-eating birds in abundance. Mid-salinity ponds support dense populations of brine shrimp, which provide a rich food source for millions of shorebirds. Only salt-tolerant micro-algae survive in the high salinity ponds, and impart a deep red color to these ponds from the pigment within the algae protoplasm. 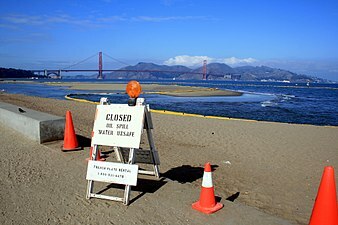 The seasonal range of water temperature in the Bay is from January's 53 °F (12 °C) to September's 60 °F (16 °C) when measured at Fort Point, which is near the southern end of the Golden Gate Bridge and at the entrance to San Francisco Bay. For the first time in 65 years, Pacific Harbor Porpoise (Phocoena phocoena) returned to the Bay in 2009. Golden Gate Cetacean Research, a non-profit organization focused on research on cetaceans, has developed a photo-identification database enabling the scientists to identify specific porpoise individuals and is trying to ascertain whether a healthier bay has brought their return. Pacific harbor porpoise range from Point Conception, California to Alaska and across to the Kamchatka Peninsula and Japan. Recent genetic studies show that there is a local stock from San Francisco to the Russian River and that eastern Pacific coastal populations rarely migrate far, unlike western Atlantic Harbor porpoise. Industrial, mining, and other uses of mercury have resulted in a widespread distribution in the bay, with uptake in the bay's phytoplankton and contamination of its sportfish. In January 1971, two Standard Oil tankers collided in the bay, creating an 800,000-U.S.-gallon (3,000,000-liter) oil spill disaster, which spurred environmental protection of the bay. 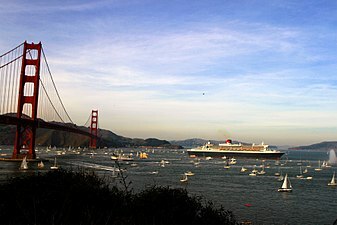 In November 2007, a ship named COSCO Busan collided with the San Francisco–Oakland Bay Bridge and spilled over 58,000 U.S. gallons (220,000 liters) of bunker fuel, creating the largest oil spill in the region since 1996. The Bay was once considered a hotspot for polybrominated diphenyl ether (PBDE) flame retardants used to make upholstered furniture and infant care items less flammable. PBDEs have been largely phased out and replaced with alternative phosphate flame retardants. A 2019 San Francisco Estuary Institute (SFEI) study assayed a wide range of these newer flame retardant chemicals in Bay waters, bivalve California mussels (Mytilus californianus), and harbor seals (Phoca vitulina) which haul out in Corkscrew Slough on Bair Island in San Mateo County, with phosphate flame retardant contaminants such as tris(1,3-dichloro-2-propyl)phosphate (TDCPP) and triphenyl phosphate (TPhP) found at levels comparable to thresholds for aquatic toxicity. City skyline through the fog, from the Golden Gate National Recreation Area. San Francisco Bay's profile changed dramatically in the late 19th century and again with the initiation of dredging by the US Army Corps of Engineers in the 20th century. 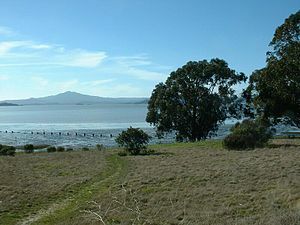 Before about 1860, most bay shores (with the exception of rocky shores, such as those in Carquinez Strait; along Marin shoreline; Point Richmond; Golden Gate area) contained extensive wetlands that graded nearly invisibly from freshwater wetlands to salt marsh and then tidal mudflat. A deep channel ran through the center of the bay, following the ancient drowned river valley. In the 1860s and continuing into the early 20th century, miners dumped staggering quantities of mud and gravel from hydraulic mining operations into the upper Sacramento and San Joaquin Rivers. GK Gilbert's estimates of debris total more than eight times the amount of rock and dirt moved during construction of the Panama Canal. This material flowed down the rivers, progressively eroding into finer and finer sediment, until it reached the bay system. Here some of it settled, eventually filling in Suisun Bay, San Pablo Bay, and San Francisco Bay, in decreasing order of severity. By the end of the 19th century, these "slickens" had filled in much of the shallow bay flats, raising the entire bay profile. New marshes were created in some areas. In the decades surrounding 1900, at the behest of local political officials and following Congressional orders, the US Army Corps began dredging the Sacramento and San Joaquin Rivers and the deep channels of San Francisco Bay. This work has continued without interruption ever since an enormous federal subsidy to San Francisco Bay shipping. Some of the dredge spoils were initially dumped in the bay shallows (including helping to create Treasure Island on the former shoals to the north of Yerba Buena Island) and used to raise an island in the Sacramento-San Joaquin Delta. The net effect of dredging has been to maintain a narrow deep channel—deeper perhaps than the original bay channel—through a much shallower bay. At the same time, most of the marsh areas have been filled or blocked off from the bay by dikes. Large ships transiting the bay must follow deep underwater channels that are maintained by frequent dredging as the average depth of the bay is only as deep as a swimming pool—approximately 12 to 15 ft (4–5 m). Between Hayward and San Mateo to San Jose it is 12 to 36 in (30–90 cm). The deepest part of the bay is under and out of the Golden Gate Bridge, at 372 ft (113 m). In the late 1990s, a 12-year harbor-deepening project for the Port of Oakland began; it was largely completed by September 2009. Previously, the bay waters and harbor facilities only allowed for ships with a draft of 46 ft (14 m), but dredging activities undertaken by the United States Army Corps of Engineers in partnership with the Port of Oakland succeeded in providing access for vessels with a 50-foot (15 m) draft. Four dredging companies were employed in the US$432 million project, with $244 million paid for with federal funds and $188 million supplied by the Port of Oakland. Some six million cubic yards (160 million cubic feet; 4.6 million cubic metres) of mud from the dredging was deposited at the western edge of Middle Harbor Shoreline Park to become a 188-acre (0.294 sq mi; 0.76 km2) shallow-water wetlands habitat for marine and shore life. Further dredging followed in 2011, to maintain the navigation channel. This dredging enabled the arrival of the largest container ship ever to enter the San Francisco Bay, the MSC Fabiola. Bay pilots trained for the visit on a simulator at the California Maritime Academy for over a year. The ship arrived drawing less than its full draft of 50 feet 10 inches (15.5 m) because it held only three-quarters of a load after its stop in Long Beach. San Francisco Bay is spanned by nine bridges, eight of which carry cars. The Golden Gate Bridge on U.S. Route 101/State Route 1 (US 101/SR 1) was the largest single span suspension bridge ever built at the time of its 1937 construction. It spans the Golden Gate, the strait between San Francisco and Marin County, and is the only bridge in the area not owned by the State of California. The Richmond–San Rafael Bridge on Interstate 580 (I-580) connects Marin and Contra Costa counties. The San Francisco–Oakland Bay Bridge on I-80 connects Alameda and San Francisco counties. The San Mateo–Hayward Bridge on SR 92 connects Alameda and San Mateo counties. The Dumbarton Bridge on SR 84 connects Alameda and San Mateo counties. The Carquinez Bridge (including the Alfred Zampa Memorial Bridge) on I-80 connects Contra Costa and Solano counties. The Benicia Bridge on I-680 also connects Contra Costa and Solano counties. The Antioch Bridge on SR 160 connects Contra Costa and Sacramento counties. The Dumbarton Rail Bridge is an abandoned bridge that used to carry rail traffic. The Transbay Tube, an underwater rail tunnel, carries BART services between Oakland and San Francisco. Prior to the bridges and, later, the Transbay Tube, transbay transportation was dominated by fleets of ferryboats operated by the Southern Pacific Railroad and the Key System transit company. 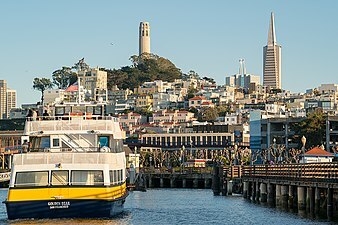 However, in recent decades, ferries have returned, primarily serving commuters from Marin County, relieving the traffic bottleneck of the Golden Gate Bridge. (See article Ferries of San Francisco Bay). The bay also continues to serve as a major seaport. 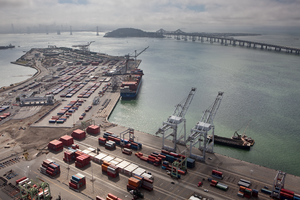 The Port of Oakland is one of the largest cargo ports in the United States, while the Port of Richmond and the Port of San Francisco provide smaller services. San Francisco Bay is a mecca for sailors (boats, as well as windsurfing and kitesurfing), due to consistent strong westerly/northwesterly thermally-generated winds – Beaufort force 6 (15–25 knots, 17–29 mph, 8–13 m/s) is common on summer afternoons – and protection from large open ocean swells. Yachting and yacht racing are popular pastimes and the San Francisco Bay Area is home to many of the world's top sailors. A shoreline bicycle and pedestrian trail known as the San Francisco Bay Trail encircles the edge of the bay. The San Francisco Bay Area Water Trail, a growing network of launching and landing sites around the Bay for non-motorized small boat users (such as kayakers) is being developed. Parks and protected areas around the bay include Eden Landing Ecological Reserve, Hayward Regional Shoreline, Don Edwards San Francisco Bay National Wildlife Refuge, Hayward Shoreline Interpretive Center, Crown Memorial State Beach, Eastshore State Park, Point Isabel Regional Shoreline, Brooks Island Regional Shoreline, and César Chávez Park. The California Office of Environmental Health Hazard Assessment (OEHHA) has developed a safe eating advisory for fish caught in the San Francisco Bay based on levels of mercury or PCBs found in local species. San Francisco Bay panorama with a view of sailboats, kite boarders, and the Crissy Field Beach. 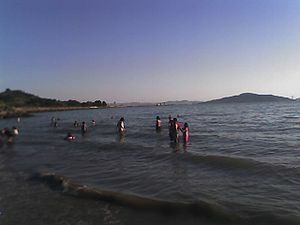 People also swim recreationally, at Kellar Beach in Richmond's Miller/Knox Regional Shoreline. J.C. Barthel, who prepared "plans for the docks and other water-front improvements in the San Francisco Bay district"
^ "San Francisco Bay". Geographic Names Information System. United States Geological Survey. January 19, 1981. Retrieved January 2, 2017. 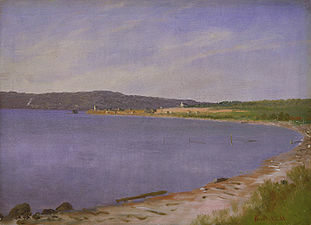 ^ "San Francisco Bay/Estuary (SFBE)". Ramsar Sites Information Service. Retrieved April 25, 2018. ^ "The Formation of San Francisco Bay" (PDF). KQED education. Retrieved June 4, 2018. ^ Yabrove, Daniel (December 9, 2013). "How the Bay was Born". Save The Bay Blog. Save The Bay. Retrieved June 4, 2018. ^ Olmsted, Nancy J. "Water on the Land—The Coast People". FoundSF. Retrieved June 4, 2018. ^ Aker, Raymond (1970). REPORT OF FINDINGS RELATING TO THE IDENTIFICATION OF SIR FRANCIS DRAKE'S ENCAMPMENT AT POINT REYES NATIONAL SEASHORE (PDF). pp. 338–340. ^ Charles F. Lumis, ed. (1900). "Narrative of the Pilot Morera, who passed through the North Sea to the South Sea through the Strait". The Land of Sunshine, The Magazine of California and the West (February). pp. 184–186. ^ "History". Save the Bay. Retrieved July 14, 2015. ^ "Bay Area Census". www.bayareacensus.ca.gov. Retrieved October 31, 2018. ^ Osborn, Liz. "Average Ocean Water Temperatures at San Francisco". Current Results Nexus. Retrieved October 19, 2013. ^ David Perlman (November 8, 2010). "Porpoises return to SF Bay – scientists study why". San Francisco Chronicle. Retrieved July 25, 2011. ^ "Harbor Porpoise Project". Golden Gate Cetacean Research. Retrieved July 25, 2011. ^ Harbor Porpoise (Phocoena phocoena): San Francisco-Russian River Stock (PDF) (Report). National Marine Fisheries Service. October 15, 2009. Retrieved July 25, 2011. ^ Conaway, CH; Black, FJ; Grieb, TM; Roy, S; Flegal, AR (2008). Mercury in the San Francisco Estuary. Rev Environ Contam Toxicol. Reviews of Environmental Contamination and Toxicology. 194. pp. 29–54. doi:10.1007/978-0-387-74816-0_2. ISBN 9780387748153. PMID 18069645. ^ Bailey, Eric (November 9, 2007). "Oil oozes in S.F. Bay after ship hits bridge". Los Angeles Times. Archived from the original on March 22, 2019. ^ Barnard, P. L.; Hanes, D. M.; Rubin, D. M.; Kvitek, R. G. (July 18, 2006). "Giant Sand Waves at the Mouth of San Francisco Bay" (PDF). Eos. 87 (29): 285, 289. Bibcode:2006EOSTr..87..285B. doi:10.1029/2006EO290003. Retrieved January 2, 2017. ^ Sandifur, Marilyn (September 18, 2009). "50 Feet Delivered!". Port of Oakland. Retrieved January 3, 2017. ^ United States. Army. Corps of Engineers. San Francisco District, Port of Oakland (1998). Oakland harbor navigation improvement (−50-foot) project: draft environmental impact statement/environmental impact report: executive summary. U.S. Army Corps of Engineers, San Francisco District. ^ "USA: Port of Oakland Secures USD 18 Million in Federal Funding for Dredging Project". Dredging Today. June 1, 2011. Retrieved March 22, 2012. ^ "USA: Congresswoman Helps Oakland Port Reach Major Funding Milestone for Deepening Project". Dredging Today. March 21, 2012. Retrieved March 22, 2012. ^ Matthews, Mark (March 22, 2012). "Huge container ship cruises into Port of Oakland". ABC7. San Francisco: KGO-TV/DT. Retrieved March 23, 2012. ^ Admin, OEHHA (December 30, 2014). "San Francisco Bay". OEHHA. Retrieved June 13, 2018. 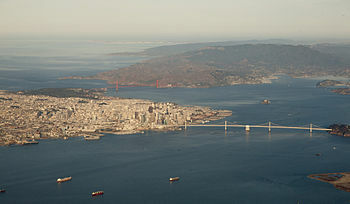 Wikimedia Commons has media related to San Francisco Bay. Wikisource has the text of the 1879 American Cyclopædia article San Francisco Bay. SF Bay Kayak, Canoe, and Boat Launch Ramp guide. A collaboratively edited guide to the SF bay.